There is nothing more American than hitting the open road during the summer months. The office and school become distant dreams and all you can think about is the beach, the lake, the city, or whatever your preferred vacation destination. Whether you are traveling with kids or other adults, one of the things that will strike you during your road trip is hunger pangs. This will make you stop at a gas station and pick far from appealing snacks to kill those pangs. Of course, this also means wasting precious time and getting caught up in rush hour traffic on the way to beaches or shores in NJ and the East Coast. Rather than stopping on the way to buy snacks that your stomach, or wallet may regret later, pack your own. Along with great music, accurate directions, and appropriate distractions (for the kids), the right snacks can help make a road trip part of a vacation memory, and not one you’d rather forget. Protein-filled sandwiches are perfect for a long road trip and help keep the hunger pangs away and the miles to pass more quickly. However, make sure that you keep out the mustard, tomatoes, mayo, lettuce and other ingredients that can drip or make the sandwiches soggy. Stick to meats and cheese and cut the sandwiches into small quarters, so that they are manageable. Drink water instead of sodas and juices with added sugars. The driver may require coffee, but too much may have you pulling over more often than usual. Fruits are healthy and invigorating. Think about carrying grapes, oranges, apples or any other fruit that is not slimy. You can cut up the fruits into small pieces for the kids and carry in containers or carry them whole, so that even the person driving can eat with one hand. Graham crackers and granola make great snacks for road trips and most children will love them. If you have time before your trip, you can make them at home or opt for ready-made ones and keep a stock to take on the trip. Vegetables, such as carrots, celery and cherry tomatoes, are healthy options, that, paired with peanut-butter or other proteins will keep you full. You can get packaged pre-prep veggies from the grocery store or you can cut up at home and carry them in a Ziploc bag. To add taste and flavor to the veggies, you can sprinkle them with some dry ranch dressing powder. If you are carrying broccoli and cauliflower florets, blanch them to make it easier for the kids to eat. Cookies are great to eat in the car, especially the small variety that you can pop into your mouth. Carry them in a plastic bag to make it easier to get them out and store them away when you have finished. Both kids and adults love candy, which can keep you energized during a long road trip, though beware of melting chocolates! Go for M&Ms, Skittles or something gummy to prevent chocolate stains in the car, and use candy as a reward for reaching certain milestones without meltdowns or tantrums from the backseat. The trip back home can seem longer without the anticipation of a great vacation ahead. Keep the memories alive — and crankies at bay — by picking up a snack or treat that’s related to your vacation location. Like salt water taffy from your hotel in Atlantic City, Florida oranges, or novelty gummy lobsters from a trip to New England. 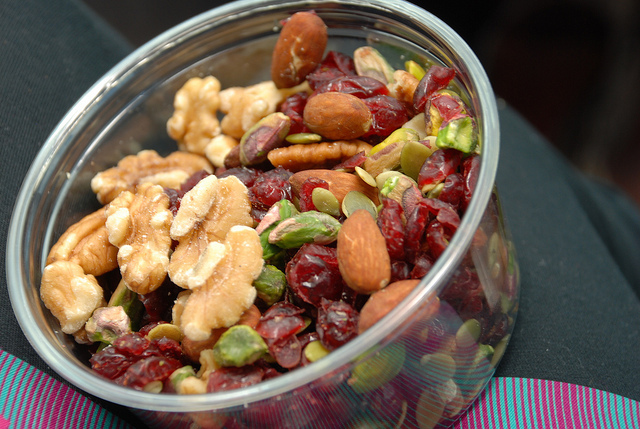 Packing your own snacks during any summer road trip saves time and money. It also makes sure that you have snacks that everyone on the trip loves and enjoys. Marilyn Smith specializes in covering the latest news and events about the gaming and hospitality industry, including hotels in Atlantic City, NJ.